(a) Remove the 2 bolts and support bracket. (a) Remove the 2 clips and unfasten the claw, and remove the tube protector. (a) Remove the 4 nuts and tank protector. (a) Remove the 3 clips ( 1), 6 nuts and tank protector. (a) Disconnect the fuel pump tube. 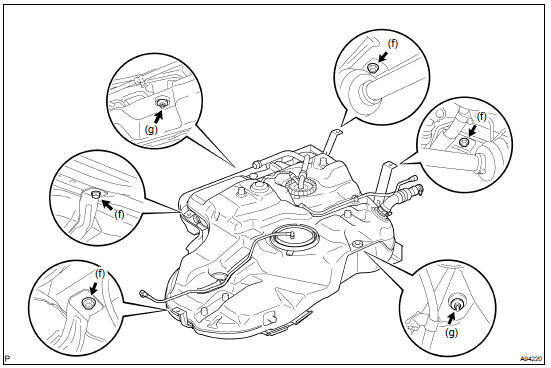 Pinch the projection of the retainer to remove the lock claws and pull down it as shown in the illustration. Pull out the fuel pump tube. Before this operation, check the connector for dirt, mud or other contamination. Clean if necessary. Be careful of mud. The connector's O-ring, which seals the pipe and connector, becomes contaminated easily. Do not use any tool in this operation. Do not bend or twist the nylon tube. Protect the connector by covering it with a vinyl or plastic bag. When the pipe and connector are stuck, push and pull the connector to release it. Then pull out the connector from the pipe. (b) Disconnect the fuel tank vent hose. (c) Disconnect the fuel tank breather tube No. 3. Lower the connector checker slightly. Pull out the breather tube. (d) Loosen the hose clamp bolt and disconnect the fuel tank to filler pipe hose. (e) Set up a transmission jack under the fuel tank. (f) Remove the 4 bolts and 2 fuel tank bands. (g) Remove the 2 nuts. (h) Operate the transmission jack and remove the fuel tank. (a) Unfasten the 2 claws and remove the tube. (a) Loosen the hose clamp bolt and remove the hose. (a) Push the connector deep into the charcolal canister to release the locking tab. (c) Pull out the connector. (d) Unfasten the claw and remove the vent hose. (a) Remove the tube support from the fuel tank. (a) Remove the bolt and nut side plate and tank bracket. (a) Remove the cushion set and cushion No. 5. 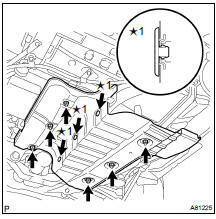 (a) Install a new tube support as shown in the illustration. (a) Set up the fuel tank to the transmission jack. (b) Operate the transmission jack and the install the fuel tank. (c) Tighten the 2 nuts. Torque: 20 NVm (200 kgfVcm, 14 ftVlbf) (d) Install the 2 fuel tank bands with the 4 bolts. Torque: 39 NVm (400 kgfVcm, 29 ftVlbf) (e) Install the connector clamp. (f) Connect the fuel tank wire connector. (g) Connect the fuel tank to filler pipe hose. (h) Connect the fuel tank breather tube No. 3. Push the quick connector to the pipe until it makes "click" sound. Check if there is any damage or foreign objects on the connected part. After connecting, check if the quick connector and the pipe are securely connected by trying to pull them apart. Return the connecter checker to its original position. (i) Connect the fuel tank vent hose. (j) Connect the fuel pump tube. Push the quick connector in the direction of the white arrow. After connecting, check if the quick connector and the pipe are securely connected by pulling on them. Push up on the retainer until the claws lock. (a) Install the tank protector with the 6 nuts. Torque: 5.5 NVm (56 kgfVcm, 49 in.Vlbf) (b) Install 3 new clips.